It could happen to the best of us: You’re on the graphics team at Chicago ABC affiliate WLS-Ch.7; you’re working a long shift; you’re hungry; you inadvertently insert an Olympics graphic that replaces Pyeongchang with P.F. Chang’s. Honest mistake! But the poor folks who accidentally slipped a “P.F. Chang 2018" graphic into a Saturday morning newscast about the Pyeongchang Olympics are now seeing their mistake skewered by news outlets including hometown paper the Chicago Tribune. Okay, it’s a bad slip-up, but would a P.F. Chang’s Olympics be so bad? It’s the only Olympics I ever have a shot of competing in, perhaps in the BBQ Spare Ribs slalom or the Dynamite Shrimp luge events. Team U.S.A., I am your hero! Unfortunately, my hopes and dreams are not meant to see the light of day. P.F. 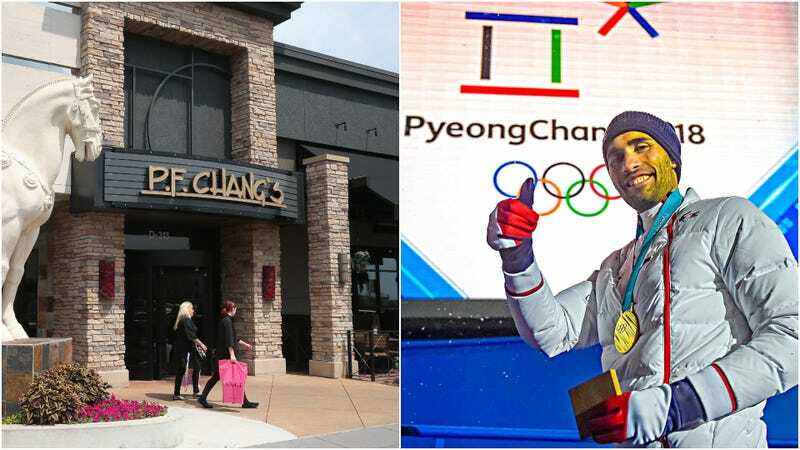 Chang’s confirms via Twitter that they are not, in fact, hosting any Olympic Games.